In your early 20’s you come to terms with this word called acceptance. Acceptance of failure, self-acceptance, accepting the other person as they are and if you have grown matured enough you learn to accept your mistakes as well. This acceptance is a very strange thing, though. We start it all in a wrong order and often at times when we had no other option. You wouldn’t accept yourself had you not been body-shamed or been hurt emotionally by someone. At least all these are a start of it. From a few bad experiences, I came to terms with acceptance. Then you try to measure success and failure and then you fail again. Life’s exams are the toughest I have realised. Then we meet people, we may fall in love, make best friends or the person may just be an acquaintance and then over time the people you would have met would be a nobody. But the people we want to keep, fiercely protect, often we just can’t accept them. We want them to fit in our ideology of perfection. But love is all about acceptance. Right? Love makes you do all kind of weird things, so you start accepting the other person as they are or the other person makes a few changes if he is convinced you are right. The most difficult of all is to accept yourself. To start from it. Most of our time goes in trying to accept the other person or finding faults in them. But, never looking into ourselves. On so many levels, we haven’t accepted ourselves yet. When I had begun coming to terms with the word called marriage, I decided to first accept myself for who I was, entirely. For a person obsessed with perfection accepting flaws of self and others was a very tough job. Few days into the new world, acceptance seems to be arriving somewhere. How are your terms with acceptance? Acceptance of self is vital in having meaningful relationships with anyone. Self acceptance is tough to come by, but when it arrives, it helps us learn to live the way we were truly intended to. You’re right, all joy and peace begins from within and it us up to us to lay the foundation by accepting ourselves with love and confidence that we’re uniquely beautiful. Self acceptance is a tough one! And it’s something we have to constantly do, at least initially, until eventually it becomes second nature. Lovely post, Ramya! Coincidentally i blogged about acceptance too. There is a sort of magic the word carries. For me acceptance is all about happiness cause that’s what it brings in to life. We allow our inner critic to rule us and that’s the problem. We are more harsh with ourselves than with anyone else. 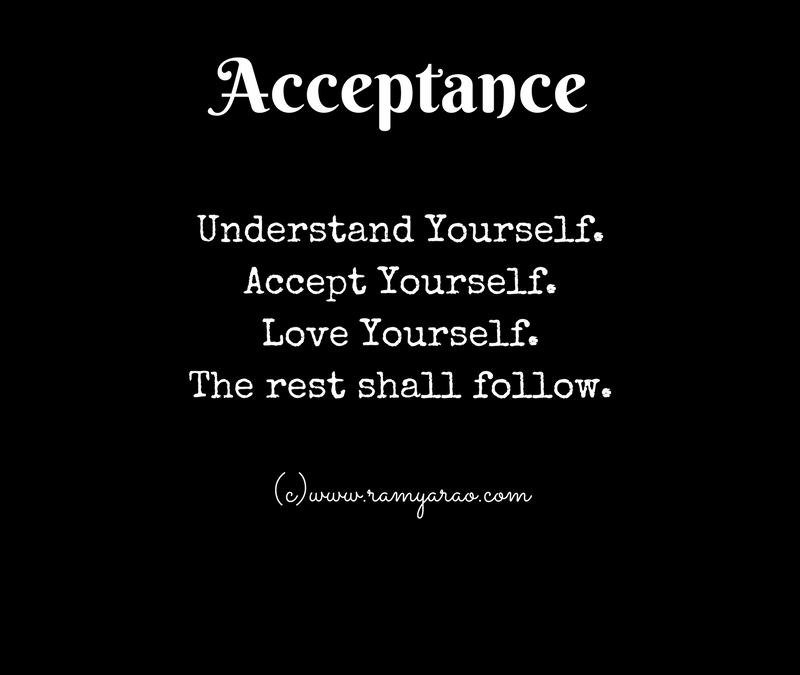 Acceptance, especially of self, is a beautiful phrase, Ramya. Love your post! Thank you for visiting my post! This post resonates so much with me! Last year, I wrote on Acceptance and it took a really long time for me to come to terms with acceptance and I learned it the hard way! But I’m happy I did! It gives so much peace once we accept the things the way they are. Acceptance of yourself is a difficult thing for a sensitive person. It shows you have a conscience. I’m 60, it is more like a feeling things could be worse, lol. But I remember they thoughts. Good post. Today I live in acceptance rather than expectation. Acceptance is the first step to recovery. One of the toughest things to achieve but the most cherished thing to have – Accepting what you are. Great write up Ramya. We are our worst critics. Sometimes I do become really critical of myself but then remind myself to just chill 🙂 I have learnt to accept my flaws. So true Ramya. This is something I’m still learning. Acceptance is very hard for me. Esp certain situations. Trying to improve. Accepting oneself is the first step towards self love and that itself lets one believe in oneself! Its a great thing to step into marriage with this realisation – all the best for your married life Ramz!